A deadly disease spreads across the world from South America. 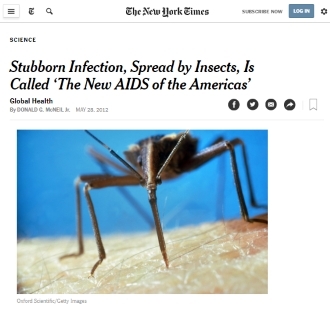 Journalists call it 'the new Aids', [nytimes.com May 28, 2012] but its official name is Chagas disease. While pharmacists are feverishly searching for a cure, Spanish molecular biologists are studying a supplement that arms the immune system against the 'new Aids': good old arginine. In South America, with more than 11 million Chagas patients walking around, everyone knows what Chagas disease is. In other parts of the world Chagas still is an obscure disease - although scientists fear this will change sooner or later because of climate change. Journalists sometimes call Chagas disease 'the new AIDS', some American doctors prefer to speak of American trypanosomiasis. 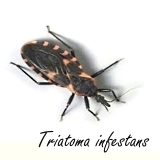 The disease is transmitted by bites from bugs like Triatoma infestans, during which the single-cell parasite Trypanosoma cruzi enters the body. Doctors can combat this parasite in the first phase of the infection, which can take place between years, with antiparasitic agents, but no longer afterwards. Because the parasite nestles in, among other things, the heart muscle and affects it, Chagas disease often has a fatal outcome. The researchers wondered whether supplementation with L-arginine, which many immune cells use as fuel, could positively influence infection with Trypanosoma cruzi. The researchers exposed macrophages to Trypanosoma cruzi parasites, and also administered arginine to some of these macrophages. 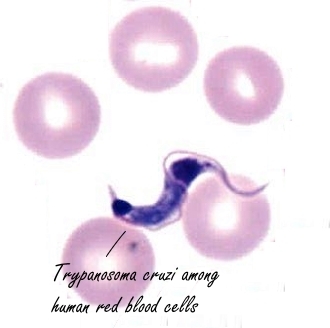 Macrophages are immune cells that literally devour and break down germs like Trypanosoma cruzi. Arginine increased the amount of nitrite in the macrophages. This suggests that the immune cells used the amino acid to produce more NO. Macrophages use that NO to break down pathogens. In addition, arginine reduced the number of parasites drastically. Arginine apparently makes the macrophages more deadly. The researchers injected mice with a deadly amount of Trypanosoma cruzi parasites. Some of the mice also received extra L-arginine via their drinking water. If the mice had been adult people, they would have received about 3-5 grams of arginine per day. The supplementation resulted in a substantial increase in the chances of survival [bottom right], which had everything to do with the increased effectiveness with which the immune system eliminated parasites [left]. "In summary, our results suggest that decreased levels of L-arginine [...] in plasma and tissues of infected hosts may be indicative of the severity of acute Trypanosoma cruzi infection, and therefore [...] [is a] putative candidate for biomarkers of pathology", resumeren de onderzoekers. "More importantly, our findings suggest that dietary supplementation with L-arginine in infected hosts, either alone or in combination with other antiparasitic drugs, may be useful for fighting infection, [..] and allowing more efficient parasite killing by NO, [...] leading to increased survival and better clinical outcomes." Stress is disastrous for your immune system. But maybe not if you use Echinacea supplements, suggests a Korean animal study. If you ask a lot of your body, physically or mentally, or youre no longer young, and you don't want to get sick, eat 100g white button mushrooms every day. Athletes who are planning on a heavy training period may be able to reduce the chance of catching cold or getting flu by taking 6 g Chlorella every day.